Bob Dylan at Princeton University, June 9, 1970. Honorary Degree Records (AC106), Box 6. In this week’s installment of our ongoing series bringing you the history of Princeton University and its faculty, students, and alumni, the first woman receives an honorary degree, a senior is arrested during civil rights activism, and more. June 15, 1978—Elizabeth “Lisa” Najeeb Halaby ’73 marries King Hussein and becomes Queen of Jordan, taking the name Noor Al-Hussein. Elizabeth Halaby, future Queen Noor of Jordan, at a Princeton football game in 1969. Office of Communications Records (AC168), Box 223. In this week’s installment of our ongoing series bringing you the history of Princeton University and its faculty, students, and alumni, an alum takes the school flag to the moon, Ella Fitzgerald performs, and more. November 17, 1983—Diplomats from the Netherlands, France, Spain, and Great Britain are in Alexander Hall to commemorate the bicentennial of the signing of the Treaty of Paris, which ended America’s Revolutionary War. Princeton is chosen because the Continental Congress resided here in 1783. November 19, 1969—Astronaut Charles “Pete” Conrad, Jr. ’53, third man to walk on the moon and Commander of the Apollo XII mission, brings a Princeton flag to the moon’s Ocean of Storms. Princeton President Robert F. Goheen observes that this is “a noble summit for the Orange and Black,” and Dean of the Faculty J. Douglas Brown orders Princeton’s rarely-flown flag to be raised atop Nassau Hall in honor of the occasion. The flag is typically flown only for Commencement exercises, or at half-staff upon the death of a faculty member. Princeton University’s flag, back from the moon and signed by Charles “Pete” Conrad ’53, Commander of NASA’s Apollo XII. Memorabilia Collection (AC053). November 20, 1936—A teenager from Harlem performs at Princeton for the first time as the featured vocalist at a dance in the old gymnasium. At the 1990 Commencement exercises nearly 54 years later, Princeton will award the woman—Ella Fitzgerald—an honorary Doctorate of Music. Ella Fitzgerald with University president Harold Shapiro at Princeton’s 1990 Commencement. Office of Communications Records (AC168), Box 170. In the fall of 1748, Princeton University–then known as the College of New Jersey– held its first commencement. During this ceremony, six undergraduate students were graduated with Bachelor of Arts degrees and the administration conferred the honoris causa (honorary degree) upon Jonathan Belcher, the Governor of New Jersey. Thereafter, Princeton awarded honorary degrees to individuals who had made significant contributions in various sectors of society including religion, academics, arts and culture, politics, science, military, and finance, among other fields. However, it would not be until 1951 that Princeton would confer this honor upon an African American. Since then, more than forty African Americans have been honored in this way. 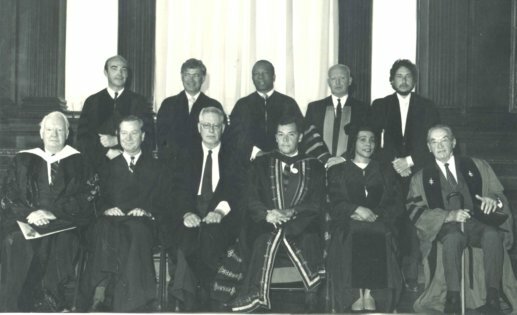 This post focuses on some African American activists and public servants who have received an honorary degree from Princeton University. Diplomat and scholar-activist Ralph Johnson Bunche was the first African American awarded an honorary degree from Princeton in 1951, receiving a Doctor of Laws degree. "A political scientist on the faculty of Howard University on leave since 1941 for government service. Stafford Little Lecturer at Princeton in 1950. Professor-designate at Harvard. An expert analyst of colonial areas and territorial affairs for the State Department and advisor to the United States Delegation at the several Conferences that initiated the United Nations. Now on loan from the State Department to be Director of the Department of Trusteeship in the United Nations. Winner of the Nobel Peace Prize for 1950 as United Nations mediator in Palestine. Where human affairs need a knowing appraisal and statesmanlike leadership, people draft him because he can be believed. His singleness of purpose brings people to the point of reconciliation, and his sincerity and simplicity inspire in them confident hope. 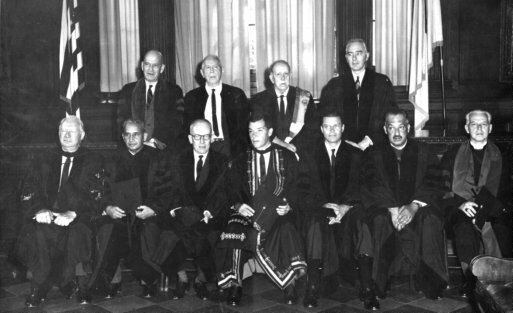 A world citizen ‘ever willing to accept as great a share of hazard as of honor.’ "
Judge and civil rights litigator Thurgood Marshall received the honorary degree of Doctor of Laws in 1963. Leader of the National Urban League and civil rights activist Whitney Moore Young, Jr., received the honorary degree of Doctor of Laws in 1967. Human rights activist and widow of slain Civil Rights leader Dr. Martin Luther King, Jr., Coretta Scott King received the honorary degree of Doctor of Humanities in 1970. 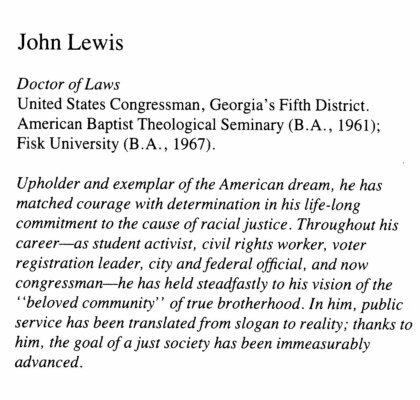 Congressman and civil rights leader John Lewis received the honorary degree of Doctor of Laws in 1987. 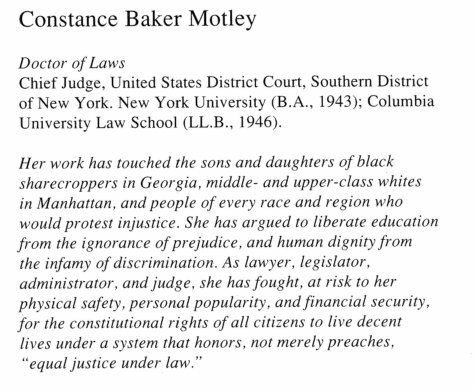 Judge and civil rights litigator Constance Baker-Motley received the honorary degree of Doctor of Laws in 1989. 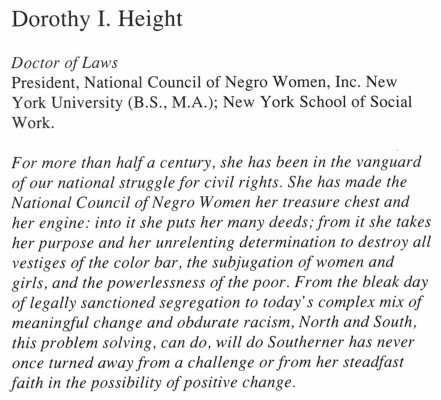 Civic leader, activist, and educator Dorothy Irene Height received the honorary degree of Doctor of Laws in 1990. Educator and civil rights pioneer Robert Parris Moses received the honorary degree of Doctor of Laws in 2002. On May 10, 1991, President George H.W. Bush came to Princeton’s campus to receive an honorary Doctor of Laws degree and dedicate the University’s Social Science Complex. This $20 million dollar project included the newly constructed Bendheim and Fisher Halls, as well as a renovation of Corwin Hall. This Reel Mudd blog post includes video of both of these events, along with other scenes related to the President’s visit. Bush receives his honorary degree from President Shapiro *64. Historical Photograph Collection, Individuals Series (AC067), Box MP2. 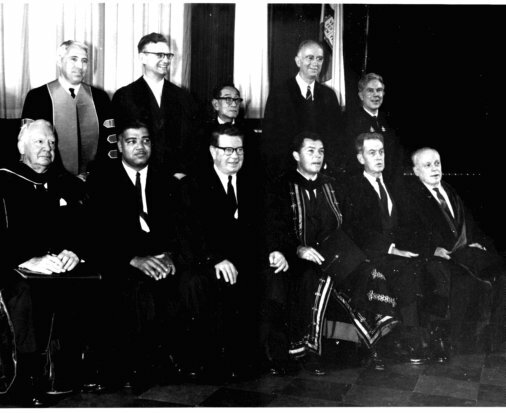 Princeton University celebrated its 200th anniversary with a year-long series of events, starting on September 22, 1946 and ending with a convocation on June 14-17, 1947. The newsreel posted here was shot during the conclusion of the bicentennial celebrations on June 17th, when thirty-six notables received honorary degrees, including US President Harry Truman, who gave the convocation address. The newsreel opens with footage of Harry Truman, posing with former president Herbert Hoover (already a recipient of an honorary degree) and the widows of US presidents Grover Cleveland and Woodrow Wilson, who were special guests. The first recipients featured are General Dwight “Ike” Eisenhower, who would succeed Harry Truman as US President in 1953, and Admiral Chester Nimitz (0:37). Both were honored for their leadership during the war, Eisenhower as Supreme Allied Commander, and Nimitz as commander of the Pacific Fleet. Other recipients shown are Dr. Vannevar Bush, wartime director of the Office of Scientific Research and Development (organizer of the Manhattan Project) and Bernard Baruch, presidential adviser during both world wars. They are followed by Warren Austin, US representative of the United Nations, and Viscount Harold Alexander, governor general of Canada (0:43-0:51). Albert Einstein, based at the Institute of Advanced Studies, but an honored guest on campus, also participates in the procession (0:31). The film ends with President Harry Truman’s rallying address, in which he urges the adoption of universal military training (1:28). The newsreel is part of the University Archives’ Historical Audiovisual Collection (part of item no. 1344).